Stylish suits are the ultimate weapon of men to get a sharp look and to be noticed at any time.How to match your suits with shirt, tie, shoes have a lot of importance. Men’s suiting is always considerable because suiting never gets outdated even if trends and styles might change from time to time. Men’s are diverse according to races and regions. Also, when they change their hairstyles or face styling, their personalities change. Unlike women, men change their get-ups in the sense of every styling methodology that they choose to adopt for themselves. For example, they will usually wear tee-shirts and jeans of funky designs with accessories like chains, wrist watches, and wristbands. They would prefer sneakers or joggers with tee-shirt and jeans. In cold weathers, most men will prefer casual coats or hoodies with tee-shirt. But when wearing formal or classical suiting, their personalities reach a whole new level. People stare at them again and again just because they see a sudden rise in their personality. Normally men love black because it suits them always, especially in night functions. In the daylight, they prefer light colored suiting to look more soft and adorable. At night they prefer strong and sharp get up to be noticed. Usually, men prefer tuxedos along with tie on dress shirt which has French or Italian outlook. Tuxedos are also worn with normal dress shirts and curvy ties having some elite designs. It is a common trend that three piece suit is worn, where coat and dress pants are of same cloth and texture but dress shirt is either of the same colors or is chosen as a contrast color scheme. Tie’s color can be according to the color scheme of the coat and pants or according to the dress shirt and coat and pants. Men love sleek designs, where their body shape must be clearly visible and they must look smart in the outfit. 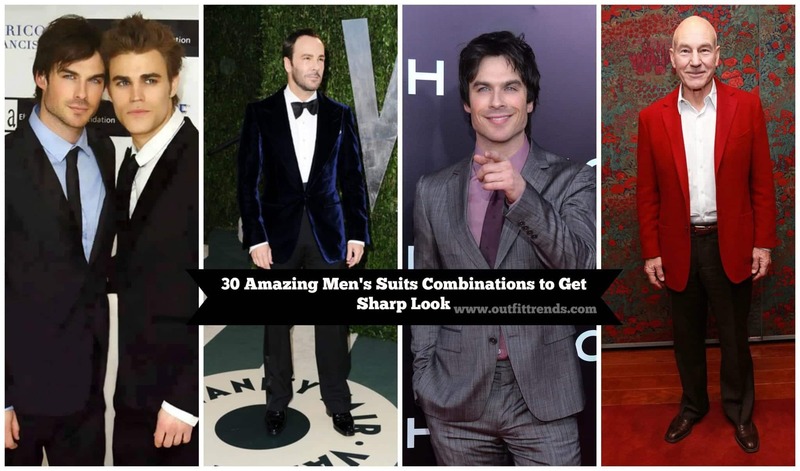 From the following pictures you can get a lot of ideas how to do smart combinations of suits ? Along with latest stylish suiting ideas for men . If you are in love with dark blue or navy blue color and you want to wear it to work too, then this next sharp look outfit idea is perfect for you. For this look, all you need to go for is to wear dark blue colored tailored two piece dress and wear is with the pure white shirt. For the tie, you can either go for deep red or you can wear one with any kind of blue pattern on it. If you’re planning on wearing both a bow tie and a pocket square then its important to pair them effectively and choose the right colors. Start by choosing a color from your shirt that you wish to highlight and then move on from there. Then choose a bow tie that coordinates well with both your shirt and your suit jacket. And then lastly, choose a pocket square to bring it all together. Purple is a great color to wear with both black and grey suits. Blue canvas shoes by Salvatore Ferragamo are definitely one of the best choice to go with blue shoes. Gray and black also make a perfect combo. Simply go for gray two piece suit and wear a black shirt underneath and go for patterned gray and black tie or a bow tie on your shirt. As we discussed earlier, blue and yellow make the coolest combination for young boys. If you are the kind of a guy who loves to wear funky colors and would wear then to work and formal gatherings too then this outfit idea is the right one for you. For this look, you basically need to wear a funky colored shirt and matching tie. For example, you can go for dark blue formal pants and coat. For the shirt, you can wear any kind of yellow plaid shirt with yellow and blue tie on top of the shirt. You can also go for a funky patterned bow tie if you want to take one step ahead. You don’t have to wear the full suit in one same color. You can always switch up the colors to make a variety of different combos. For example, you can wear brown jeans with dark blue formal coat and wear a plain white shirt underneath. You can also choose to wear brown oxford shoes underneath. Wondering what watch to wear with a suit? Here’s all you need to know:Make sure that the cuffs of your shirt cover your watch. Make sure that the cuffs of your shirt cover your watch. Choose a dress watch if it’s a formal occasion, leather bands are definitely not the right choice here. Avoid over flashy watches, especially if you’re dressing for an interview. Never wear the watch on top of your sleeves. Silver watches go best with black, blue and grey color suits and golden watches are more suitable for shades of brown as well as pastel shades. If you’re still confused, one great and fail-safe way is to match your watch with your shoes. Ian Somerhalder recently married Nikki Reed and thy both looked awesome in the outdoors wedding photoshoot. Ian’s outfit defitnitely showed that off-white suits are the best option for outdoor events during the daytime. If you’re dressing up for a garden wedding then it’s always a great idea to add a touch of nature to your outfit like Ian did. The pantone color of the year in greenery so go ahead and get a suit, shirt or accessories to wear this fresh and beautiful color. Before you choose any suit for yourself it is very important to know your body type and what design is recommend for you as it gets on proper fitting on your body. Let us know what tricks and tips you use for a sharp look. Some men even wear two hoodies at after! I immwr verbrachte meine halbe Stunde, um diese zu lesen Blog s Artikel oder Bewertungen alltäglichen zusammen mit einem Tasse Kaffee.